Hospitality is a customer-focused industry, with a hotel brand’s reputation and ultimate success dependent on the quality of the experience of its guests. 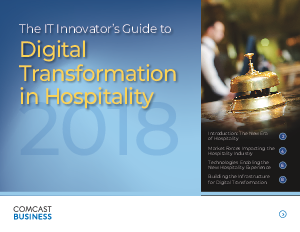 It is no surprise then, that digital transformation efforts within the hospitality sector are focused on technologies that improve the guest experience, from check-in to check-out and everything in between. Today’s travelers are digitally savvy, using their smartphones and mobile devices for a multitude of tasks. They expect a high-quality connection throughout the property and the ability to perform certain tasks from the hotel’s app, such as checking in and choosing their own room. They expect in-room entertainment beyond basic cable and in-room digital devices they can use to order food, book a massage or control the lighting, for example.